When you turn on your air conditioner or heater the cabin air filter jumps into action. This filter is designed to remove dirt and pollen from the air that enters the passenger compartment of your car. The HVAC system will bring fresh air from outside the car unless it is on the recirculation mode. This means any impurities in the air are brought into the car and into your lungs. 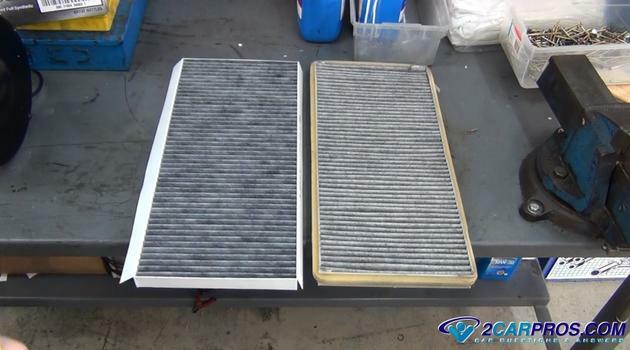 The cabin filter is a regular service item and is situated at the air intake duct or somewhere in the heater box plenum. Some cars do not have this filter so its best to check your owners manual or see if they sell the part on Amazon letting you know your car probably has the filter. 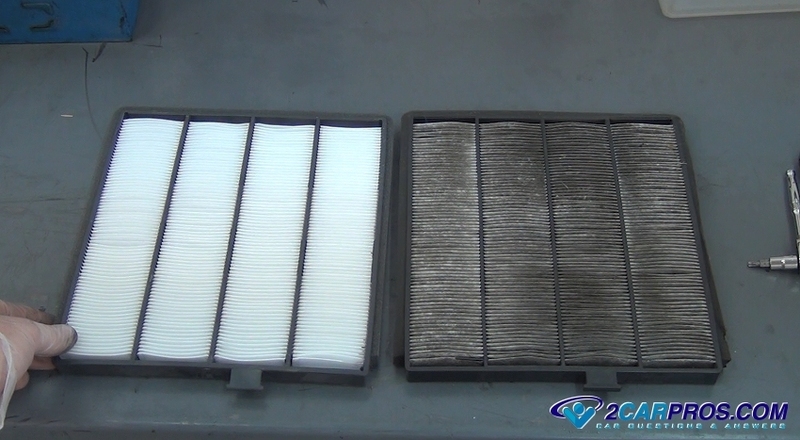 If the filter is neglected or your car is driven in dusty areas the filter will become plugged slowing the air flow through the vent system. These filters can also retain moisture which can smell like mildew especially during the rainy season. If you were to take your car into a garage for an cabin filter replacement it can cost between $65.00 and $85.00 (US) depending on the filters location. If you do the job yourself and the filter should cost between $9.00 and $12.00 (US). How Long Do Cabin Filters Last? Because the filter does not process as much air as the engine filter it can be changed less often. Most manufactures recommend between 30,000 and 40,000 miles depending on driving conditions. 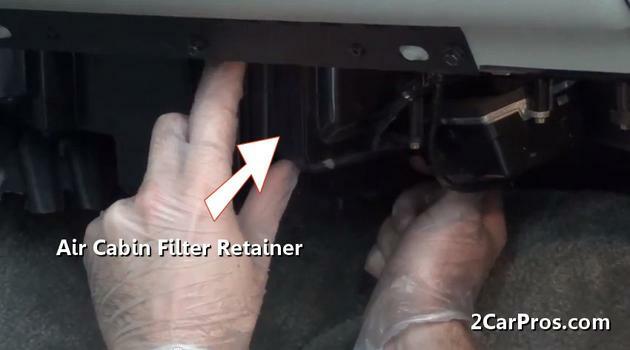 Here is a video of the job being done for a filter that is under the dash on the passenger's side. The under the hood and behind the glove box style of cabin filters are shown down further in this guide. Begin with the vehicle on flat ground, in park with the emergency brake set. Replacing the cabin air filter is relatively simple and can be performed in a few minutes with minor tools in most cases. 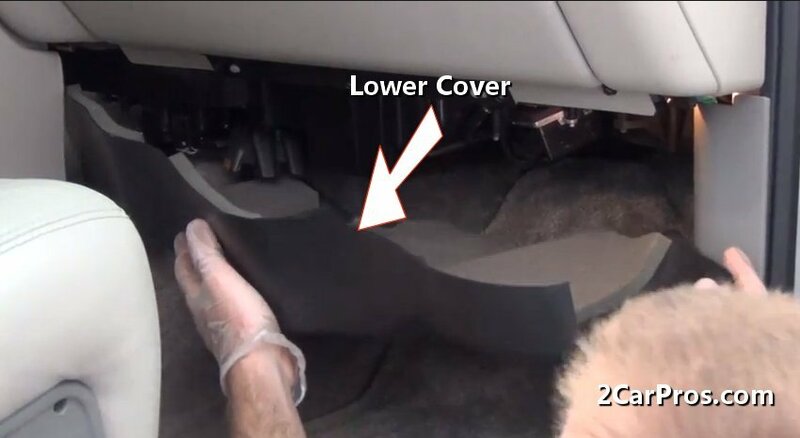 Remove Lower Dash Cover: A cabin filter is an option on most cars so some will not have this filter. Some filters will be accessed through the bottom of the heater box while others will be done by removing or lowering the glove box door or raising the hood of the engine compartment. Begin by locating the filter which can be under the dash on the passenger's side. On this example the filter is under the dash so start by opening the passenger door to begin the cabin filter replacement. Remove the mounting screws that hold the lower cover in place. These screws can be obscure so look around. The bolt size is usually 5.5mm, 7mm or 8mm and you may need a universal to get at some of them. 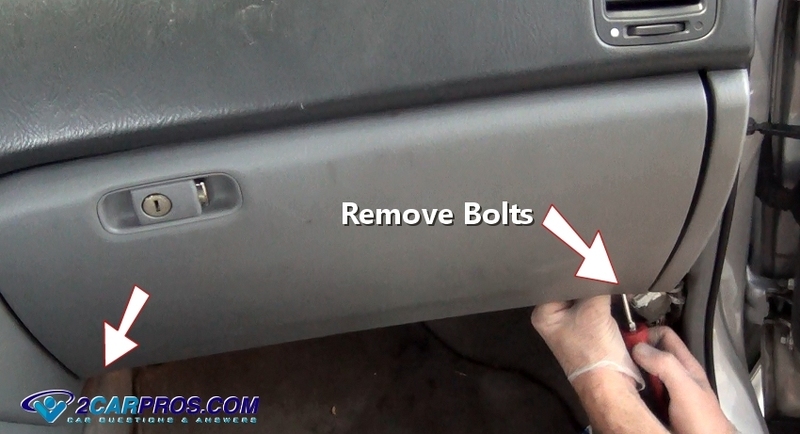 After the bolts have been undone remove the lower dash access cover. 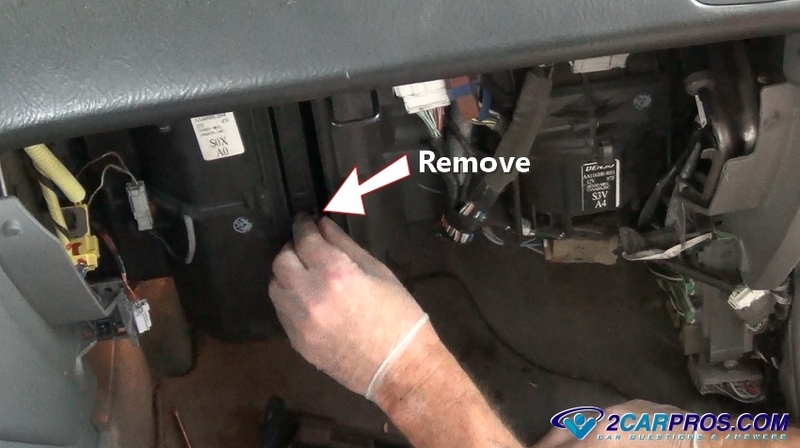 Remove the Cabin Filter: There will be a small door or strap that holds the filter in place which can be removed by undoing the clips or screws. Look around to see the method of removal which will be a little different for each manufacturer. Once the retainer has been removed slide the old air cabin filter from its housing. Be ready because if the filter has not been changed for a while there can be dirt and leaves which will come out with the filter and will go all over the carpet. We will sometimes put a paper floor mat down to catch this unwanted debris. 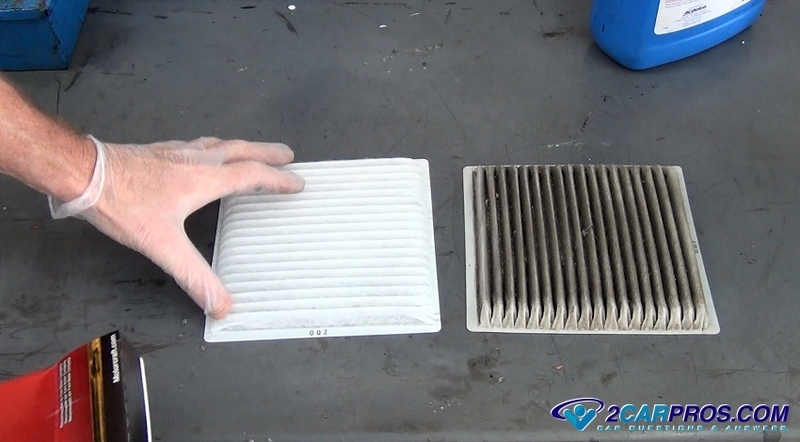 Match the old cabin filter to the new filter to ensure proper installation. Then use a damp cloth to wipe clean the filter housing and cover. 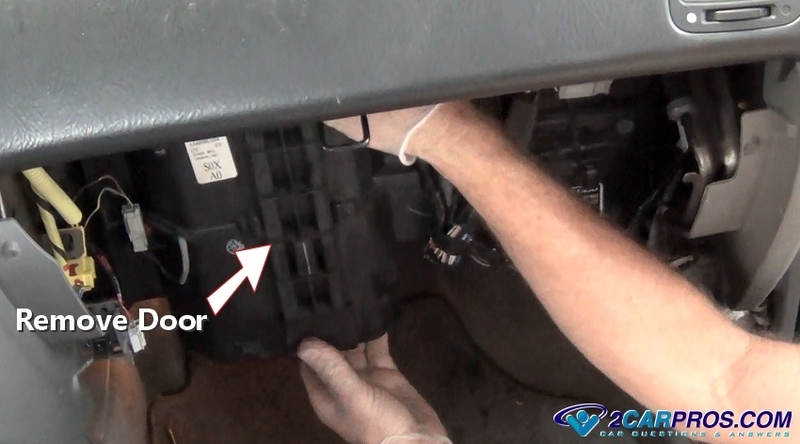 Some vehicles utilize two filters so look up side the housing to make sure there is not an additional filter. 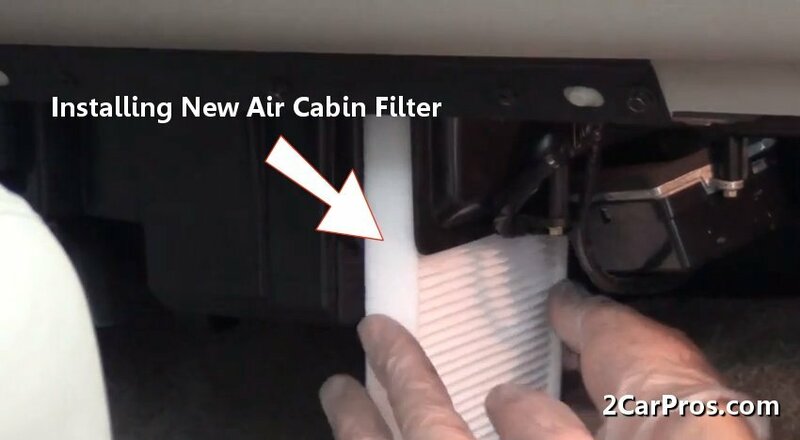 Install the New Cabin Filter: It is important not to get grease or other contaminants on the new filter because the air that passes through it you will be breathing and smelling the entire time you drive. Also these filters can be rather flimsy and can be damaged if there are forced into position so take care when pushing them into place. Position the bottom bracket or plate into place while making sure the retainer clips are aligned so there are no leaks. 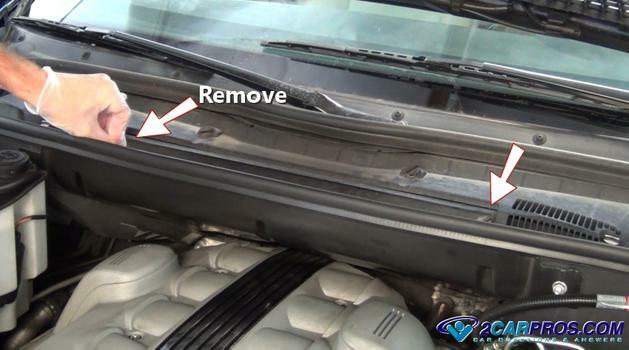 Do not use excessive force during reassembly because the heater core and air conditioner evaporator is in close vicinity and can leak if mistreated. 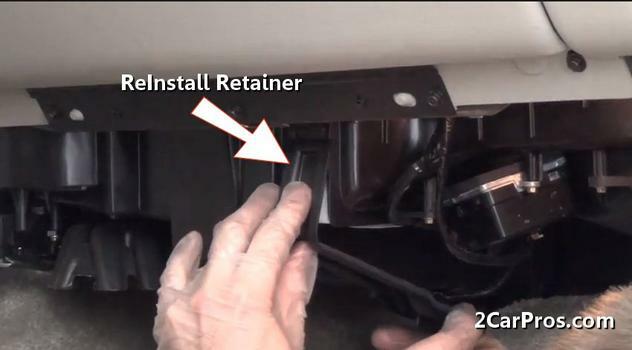 Reinstall the retainer screws using a socket or small wrench. These screws are mounted in plastic so they don't need to be super tight. Double check your work at this point and make sure no wires or tubes that have been caught in the bracket or door. Reinstall Lower Cover: Gently set the lower cover in place. Align the screw holes and insert the mounting screws by hand to avoid stripping and cross threading. 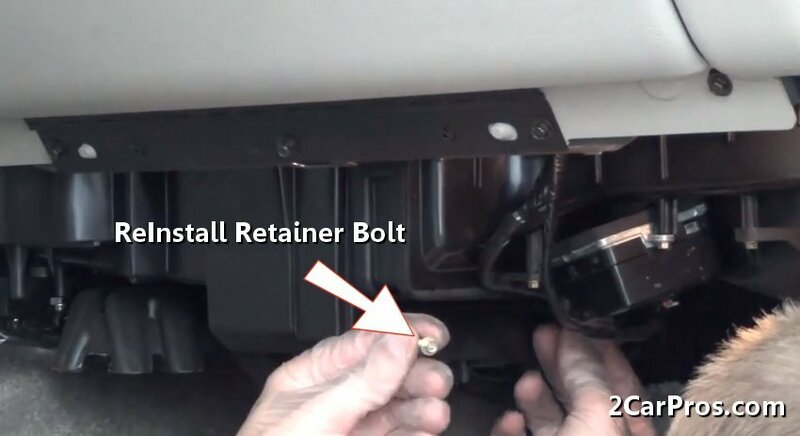 Tighten the screws using a small ratchet or wrench. 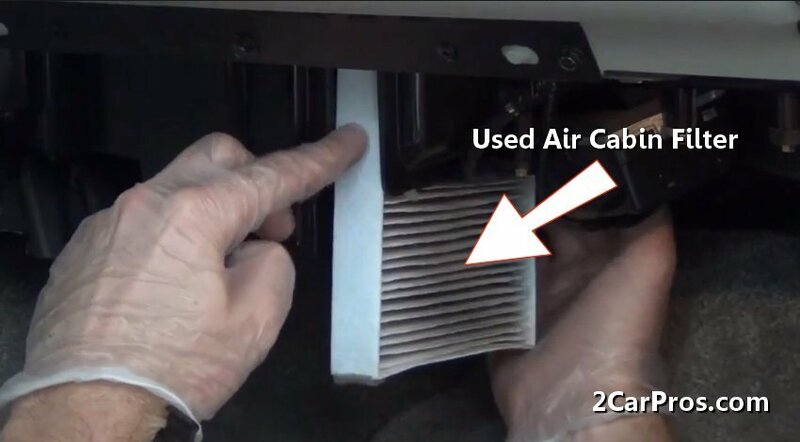 Watch the Glove Box Cabin Filter Video! 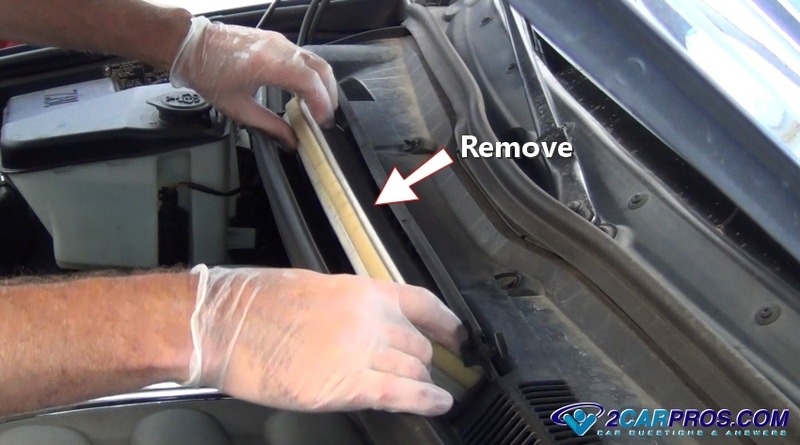 Here is a cabin filter replacement that involves removing the glove box door. 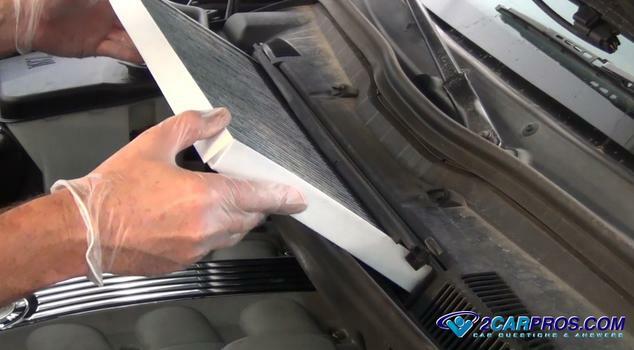 Once you are done continue down the guide to see the under hood cabin filter replacement. 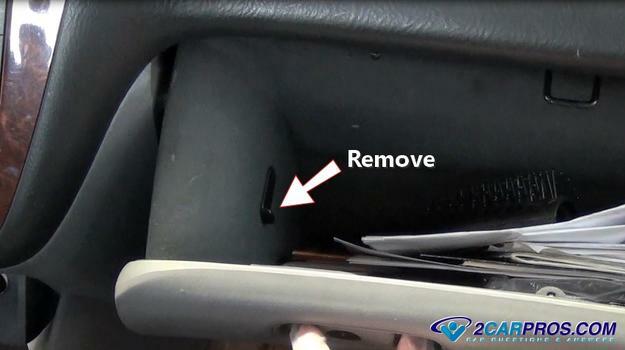 Remove the Glove Box Door: Operate the glove box door latch to open the glove box. 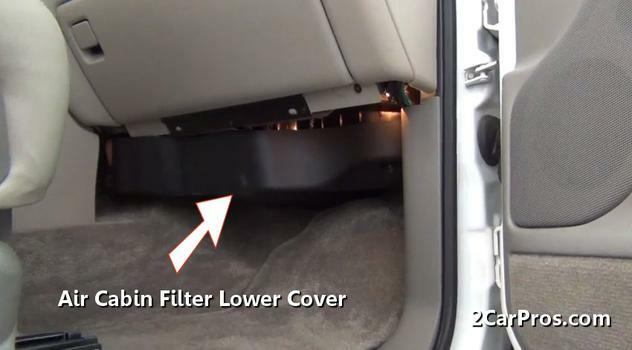 In most cases you will be able to see the cabin filter trap door which the filter will be behind. There will be one or two clips that must be removed or bent inward the fully open the glove box door. There are a couple different methods that are used to achieve this. After removing both clips for the glove box limiters it will expose the cabin filter hatch door. At this point you may or may not be able to get at the hatch door. If this door is blocked you may need to remove the cross bracing the glove box as in this case. Locate the glove box door mounting bolts which must be removed to get the box out of the way. Use a screwdriver or small socket usually 7mm, or 8mm 10mm to break loose and remove the mounting bolts. Then use a small socket usually 7mm, or 8mm 10mm and break loose at remove the remaining mounting bolts of the cross brace. This will be able to be done from either straight on or under the brace depending on design. Some cars will have these two items incorporated in which case there will be only one set of mounting screws. Now that the glove box and cross bracing have been removed it will allow you to gain access to the cabin filter hatch door. These doors are usually held in place by plastic clips or snaps. Sometimes a door will have mounting screws which can be removed easily at this point. Grasp the hatch door and pull gently outward, this will remove the door. Now the cabin filter will be exposed. Grasp the filter and pull it outward from the heater box. Some filters can be a little stuck due to the weather and the ages of the car. If the filter is stuck wiggle it back and forth which should break the seal loose. As you can see this filter is very dirty and was affecting the air flow of the vents. Match the old cabin filter to the new cabin air filter. This will ensure a good seal inside the heater box and not allow any unfiltered air to be circulated. 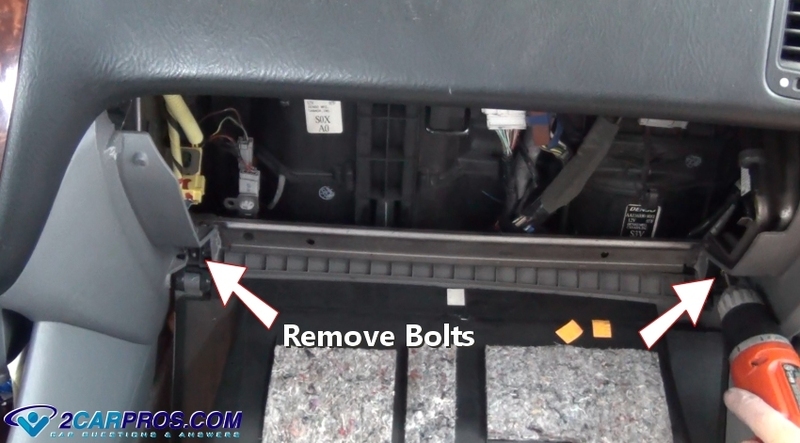 Reassemble the heater and glove box the same way it came apart and you are all set. 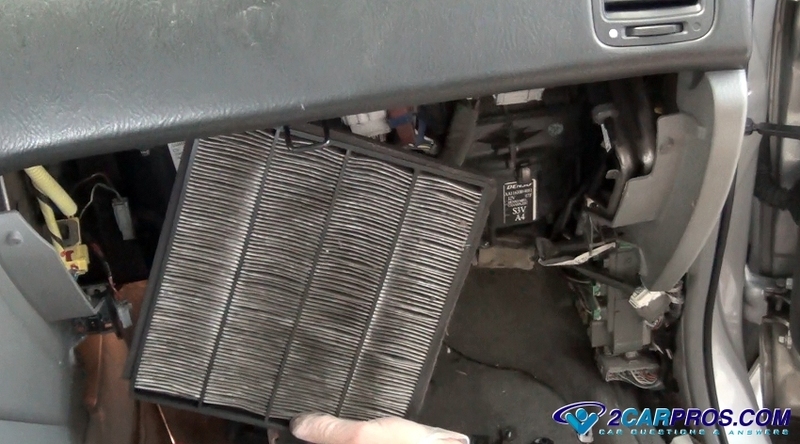 There is one last style of cabin filter change which is featured below. Here is a video of the job being done for a filter that is under the hood which is at the heater and air conditioner (HVAC) air intake. Remove Cabin Filter: Open the hood and locate the trap door which will house the cabin filter. These locations can very but will be obvious in most cases. Lift the access door to expose the filter. Grasp the filter and gently side it upward to remove it from the air ducting intake port. Match the new filter to the old filter. In this example the new filter looks dirty but it is made with a special dust inhibitor which makes the filter look gray. The old filter was white before it was installed (right). Before installing the new filter clean any leaves or dirt from the air duct. Then replace the door cover and you are all set. If you have any questions about cabin filters please visit our forum. If you need car repair advice, please ask our community of mechanics who are happy to help. Our service is always 100% free.